﻿This year’s Northern Hemisphere tropical cyclone season remains active with storms continuing to affect the Caribbean and the Bay of Bengal. 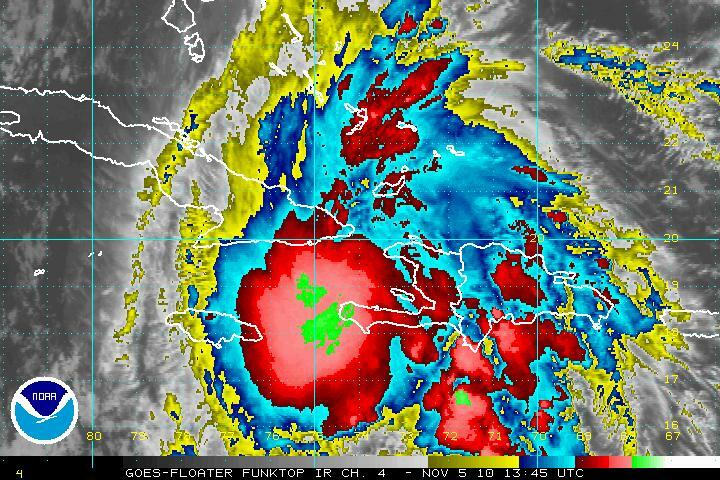 In the Caribbean Haiti, the Dominican Republic and Cuba are experiencing heavy rains and strong winds as Hurricane Tomas crosses the area, while Cyclone Jal has developed over the Bay of Bengal and is likely to hit India on Sunday. Tomas strengthened as it moved north during the last 24 hours, bringing torrential rain and the risk of life threatening floods and mud slides to Haiti and the Dominican Republic. The Met Office has been supporting Shelterbox in Haiti throughout this year, providing regularly updated forecasts to them, along with other charities working in the region following the devastating earthquake at the start of the year. The Met Office is providing forecasts to the Foreign and Commonwealth Office, charities and other National Meteorological Services around in the world, to provide the best advice on the expected movement of both Hurricane Tomas and Cyclone Jal. You can keep up to date with the latest tropical storm news on our dedicated twitter channel @metofficestorms. This entry was posted in Met Office News and tagged Dominican Republic, Haiti, hurricane, Met Office, National Hurricane Center, ShelterBox, tropical cyclone, weather, weather forecasting. Bookmark the permalink.